WARSAW, Poland -- A Ukrainian official is disputing a claim by the Polish prime minister that Poland has taken in 1 million Ukrainian refugees, adding a new element into the debate over refugees in Poland. Polish leaders have argued for months that Poland can't accept many asylum-seekers from the Middle East because the country is burdened by helping Ukrainians who fled the fighting in eastern Ukraine. Poland's sharp resistance to taking in Muslim refugees has strained its ties with other European Union states, particularly Germany, which has taken in large numbers of asylum-seekers and wants help from other EU members in absorbing the huge numbers of newcomers. 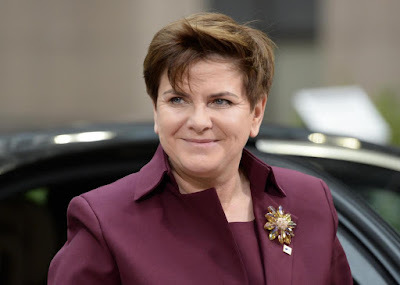 Prime Minister Beata Szydlo told the European Parliament that "Poland took about 1 million refugees from Ukraine, people that nobody wanted to help." She spoke Tuesday during a heated debate on perceived violations of the rule of law by her new government. "There are no refugees from Ukraine in Poland," he said. "They are people who travel and stay here legally, working, studying and paying taxes, and they contribute to a certain extent to the development of the Polish economy." Deshchytsia said Poland rejects almost all requests for asylum from Ukraine since it argues that Ukrainians can instead seek safety in the parts of their own country that are free of conflict. In 2015, 920,000 Ukrainians had visas for Poland while 65,000 had residency permits, government spokesman Rafal Bochenek said. Many Ukrainians use the temporary visas to live and work in Poland, whose healthy economy offers more opportunities. Often they clean homes or care for the elderly or children, for wages that run around 15 zlotys ($3.70) per hour in Warsaw. Bochenek agreed that very few Ukrainians receive refugee status because "it is very difficult for them to prove that they are oppressed." Still he said while Ukrainians lack formal refugee status they are still being helped by the Polish government.